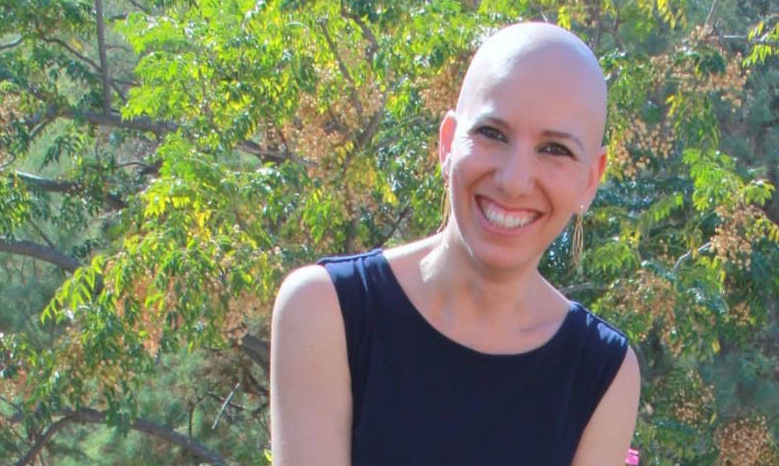 When Keren Barak shared that her years with alopecia areata in the Israeli Defense Forces were life changing, we wanted to know more about her recipe for success. Keren is determined to live a beautiful and fulfilling life even though hair loss in women presents countless and unpredictable challenges. Just before this interview, a disturbing incident tested her yet again. There aren’t that many bald women on the Israeli street. A week ago, I was wearing a black business suit while waiting for my husband on a regular road in Ramat Gan, a suburb of Tel Aviv. Two religious guys walked by, spit at me and called out “lesbian!” It is hard to avoid being hurt and I can’t pretend I wasn’t. But I was only hurt for a second and then I chose to let the hurt go and instead feel sorry for them --- for their stupidity. Their reaction does not reflect the Israeli street as a whole, but does represent one aspect of it. I face many reactions – some negative, some amusing, and some of the “wow, cool!” variety. At the beginning of my career as a statistician in the banking industry, I used to interview wearing a wig. After I would get the job and after several months – basically once people got to know me as “Keren” --- only then would I allow myself to take the wig off. He smiled and said that he really doesn’t care. I worked at the company for eleven years, and am still friends with Ephraim, the CEO. I used this monologue when interviewing for my current job, too. I emphasized that the baldness is a symptom of a disease and that it doesn’t really bother me that I have it. I have learned that it is important to be open and to share information. People are curious, and a lack of information leads to rumors and gossip. I very much appreciate it when people stop me and ask me about my baldness. "The Gull Sees Farthest ..."
I was somewhat worried about the impact a tattoo on my head might have in the banking world. However, I went to work with my head held high and a big smile – as is my habit – and they accepted me tattoo and all. Behind the tattoo is also my desire that people stop feeling sorry for me. When I set up a meeting with someone, I just tell them to look for the bald woman. It definitely breaks the ice! The baldness helps me because people remember me. I stick out, and I’ve learned to enjoy it. From a mousy child who was afraid of her own shadow, to a gorgeous woman who is self-confident and proud of herself – I owe it all to my baldness. I simply don’t know where I would have been without this disease. I don’t believe I would have had the self confidence or the love that I have for everyone including the strange, for the awareness I have of others, for my thick skin, and more. I have taught my children to love themselves and to choose not to get hurt. I explained to them that when people laugh at me on the street, I choose not to be hurt. Instead, I feel sorry for them and for the fact that they are not very smart. I taught my children about alopecia areata and when some of the kids made fun of my six-year-old son, saying “Your mom is bald!” he simply replied “Yep. She is.” And that was that. He wasn’t hurt or anything. I was so proud of him! When I was walking in the mall with my ten-year-old daughter she asked why people were staring at me. I told her “Don’t you know it’s because I am so gorgeous?” She laughed and said “That’s true, you ARE gorgeous!” She understood what I meant. My kids are sensitive to others. They don’t stare and they are not afraid to approach people who are different or disabled. I always see the glass as half full and only take the best that my life has to offer. For me, the baldness is a huge advantage. I have been married for 13 years, have three fabulous kids and a fantastic job. I get up every morning with a smile on my face and go to work happily. I am grateful for that. 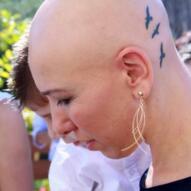 Our global Bald Girls Do Lunch network is teeming with women like Keren who share their triumphs and their life lessons. We would love to hear about your experiences. Drop us a line any time to info@BaldGirlsDoLunch.org.